"For even she knew there was only so much one could do to protect a winter moth drawn to an icy flame." Both figurative and literal, the writing of this book's magic was nothing short of extraordinary. This book focuses on two people, Vika and Nikolai, who are locked into a duel of magical abilities to see who will prevail and be named the Imperial Enchanter who will protect the tsar and Mother Russia herself. How they compete is with amazing displays of their magical abilities and that's all I'll say about that. I don't want to ruin what they do by telling you, it's worth the wait and surprise. I will say it's beautiful. I didn't know what to expect with regards to the actual competition and how it would play out but I loved how it did. The magic of Vika and Nikolai was truly brought to life with the magic Skye weaves with her expressive writing. The romantic aspect in this book is as subtle as the magic is overt. Voka and Nikolai are stuck in this competition but cannot help being drawn to one another. The fight they each have other their feelings for each other and the Game is truly a Catch-22. The sparks that fly between them and the few shared moments are electric. Nothing short of a fairy tale. What I didn't expect was to become so involved with Pasha, tsarevich and best friend to Nikolai. I know a lot of people are opposed to the dreaded love triangle to an unhealthy level but I truly enjoyed reading about all aspects of these three peoples' relationships to each other. It was not contrived in the least and I really liked what Skye did with her characters and I hope all readers can enjoy them separately and together as much as I did. That masquerade ball? Daaaaaaayum, girl! I was melting with feels and swoons and everything in between! I really loved reading this book. Truly. However, having read The Night Circus before I couldn't help notice how similar they were. If I hadn't read The Night Circus, this book would have been acutely unique and extraordinary to me but the similarities between them were obvious so it stopped me from fully loving this book to a 5 star level. 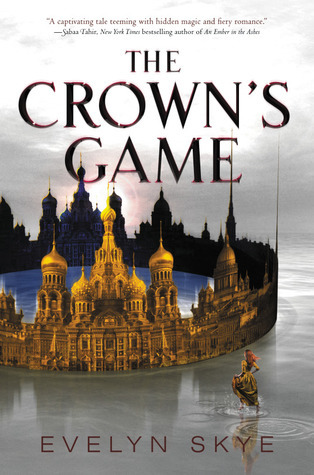 I would still 100% recommend reading it even if you have read The Night Circus because on its own The Crown's Game is still ethereally beautiful and romantic. If you love magic, forbidden romance, and impossible choices...this book is for you. Question: If I read The Night Circus after having read this one, would it not go well for me? I'm just curious! But I definitely enjoyed The Crown's Game. I thought it was so magical, and I loved the setting as well too. I really like the direction the story took, and I'm just dying to know what will happen next!